The children are gone and my wife and I are retired. We undertook a major renovation of the merging of two very small bedrooms at a family cottage my wife and I moved into, I promised my wife a mirror next to her closet. The design is done to match some of the fluted woodwork with a sill that has a bowl bulging out on one side for her earrings or rings of the day to be placed. The top is a simple arch with a carved heart that should be explanation enough of what it means. The mirror is made entirely of hard maple. Along the top and top sides is a leaf and white flower vine pattern that I painted on using acrylic paint made for glass and porcelain. A fun and memorable build for the love of my life. The last picture is that of the room sheet rocked, painted, and ready for the woodworking and mirror. I really love the little ring holder on the bottom. I bet it brings a smile every day! The painting adds a lot of character/charm to the mirror itself (and the colors are perfect), but I find the little storage area you added to the wood frame itself particularly striking. Very nice work! you have out done yourself on this one. Great job! Very well done. 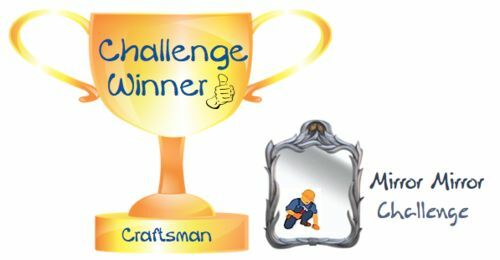 Craftsman, you did a great job on this mirror. I love the story with it too.